A sweet and salty cookie with brown butter, milk chocolate chips, bittersweet chocolate chips, toffee and salty kettle chips all in one cookie. Everything but the kitchen sink. These cookies were inspired by a cookie from one of my favorite cafe, Panera, The cookie their has caramel, chocolate chip and pretzels. I wanted to do something a little different from that cookie to get a sweet, salty and crunchy cookies. You can get all of that in one bite, sign me up for that. Sweet from the chocolate, toffee and brown sugar. Salty and crunchy from the potato chips. Also get a slight nuttiness from the brown butter. I choose to use kettle cooked potato chips because of they are crunchier than regular chips and they hold up better in the cookie dough. 1. In a medium sauce pan, simmer butter on medium high for 7 to 10 min minutes or until lightly brown, like peanut butter or caramel. Transfer to a large bowl and let cool for 15 to 20 minutes. The two sticks and 3 tablespoons will equal out to one cup once it melts and browns. 2. In a medium size bowl, whisk together flour, baking powder and sea salt. 3. Once the butter has cooled, strain using a cheesecloth or mess strainer to get the brown bits from the bottom. Add brown sugar and granulated sugar to the cooled browned butter. With an handmixer, beat butter-sugar mixture for 2 to 3 minutes. Then add room temperature eggs and vanilla extract, mix until lighter in color. 4. Slowly add in flour mixture a 1/3 at a time, mix until flour mixture is incorporated. Toss chocolate chips, toffee and potato chips into the last 1/3 and fold into batter. 5. Cover with clingwrap and chill for at least 4 hours. 6. Preheat oven to 350 degrees and cover 2 to 3 cookie sheets with parchment paper. Scoop out 2 to 3 tablespoons worth of cookie dough leaving a enough room for spreading and bake for 10 to 12 minutes. 7. Let cookies cool on the pan for 5 minutes then transfer to a wired rack to cool completely. Store in a cool place. That sounds just crazy enough to work! Who would have thought to put chips in a cookie! You are so creative and come up with some of the neatest recipe ideas! These cookies are so different than others that I've made. They have the perfect bit of everything, so delicious looking! Thanks for the recipe. 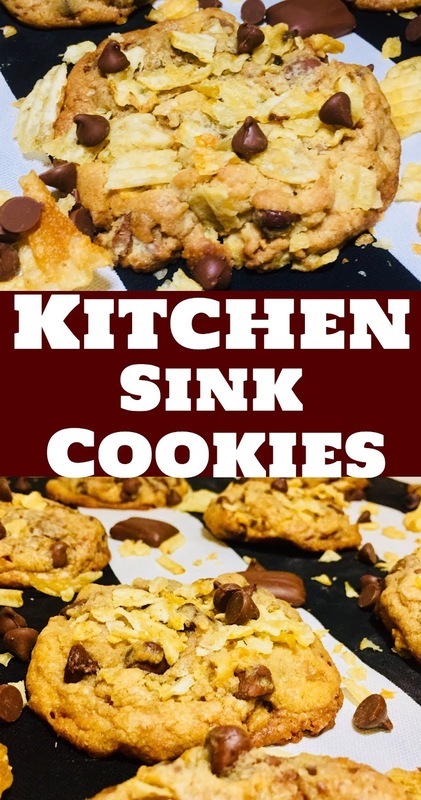 Kitchen sink cookies are so good! I love how you put chips in there, chocolate and chips two of my favorite things in cookie from. Yum. I've been looking for cookies with chips in them ever since I had them in Hawaii! They are SOOOOO good! I would imagine the cookies has a crunchy bite, chocolate and chips on cookies, so fun! Okay, now I really need to go make some chocolate chip cookies. These look amazing!! These look delicious. I've never tried cookies like these before, but this recipe seems right up my alley! I love sweet and salty flavors together and I think the chips would add a great crunch to these! My hubby doesn't love sweets but he would probably devour these before I even could LOL. Oh these look SO good! and Easy! These look and sound absolutely delicious. Those ingredients sound like they would be so good mixed together. The chips should keep their crunch, I can't wait to try them. I've saved this for my mom because she has been looking for something to make for a while now. Thanks! I love the name of these! These are perfect for those who like the sweet/salty taste. Love this idea! Those chocolate chip cookies sure look delicious! Thank you for sharing the photos and recipe. These look so lovely. I love the unique name they have too. They would make a good addition to an afternoon tea party. This looks so good! My son's birthday is this week, he would love a sweet treat like this. Thanks for sharing! Oh wow, these look so yummy!! I love the idea of mixing salty and sweet flavors in a cookie! This is something your can prepare ahead and chill in the fridge. You can bake when needed so you have freshly baked cookies every time. This is brilliant. I can almost feel the crunchy texture. Will have to try out this recipe next time Im baking. Thanks! Wow these look so delicious. I love toffee in cookies. It makes such a great taste and texture. The combination between sweet and salty sounds so yummy. Overall the look delicious, never thought you could use chips in to cookies. Those look sooo delicious! I am always looking for cookie recipes. I never would have thought to put chips in a cookie - very interesting! These look delicious! Ill need to try these for sure. I love the sweet and salty flavors together! wow those look amazingly delicious. I am most definitely going to be trying those. Thanks for the recipe! Yummy! Those cookies would be awesome for a movie night. omg chips in a cookie? Sounds incredible! This is the perfect way to get that sweet an salty craving! I love this unique cookie idea! This sounds really tasty and interesting! Since it doesn't take too much time to bake, I want to make these someday! :) Bookmarking this! These looks so good the perfect combo of salty and sweet!! These look amazing!!! I love the addition of kettle potato chips. Brilliant! Sweet and salty is my go-to! I'd rather have that over just sweet! These look so yummy! These cookies are seriously out of this world, they look so scrumptious, can't wait to try the recipe. I definitely want to try these. Thanks for explaining why you chose kettle chips over regular--I'll be sure to pick up some of the kettle cooked ones. Now this is my kind of cookies! Caramel, chocolate chip, and pretzels in one cookie sounds like heaven to me. I'll definitely make time to do this!